Overview - Click here to use Report Maker now for free. Report Maker has gone online! No need for any software to be installed on your PC, Mac, iPad etc. All you need is a web browser. Report Maker allows pupil reports to be generated very quickly. Since its initial release in 1996 Report Maker has evolved into a professional product that is used by teachers, schools and other organisations worldwide. Report Maker allows teachers to create pupil reports and Record of Achievements (ROA). The reports are generated from a 'database' of statements, which can be customised to suit the individual teacher. Report Maker enables reports to be generated very quickly and easily. Used in conjunction with your usual word processor Report Maker can produce very professional looking and sounding reports. 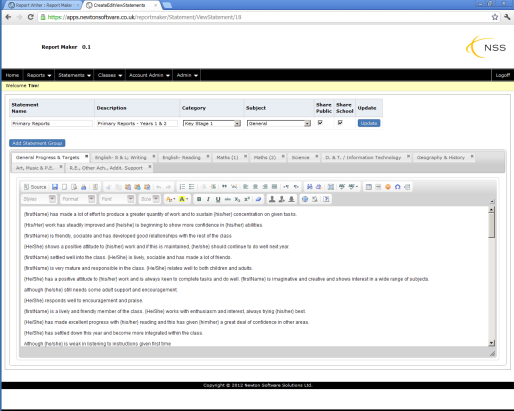 Report Maker features a main text box where each report is generated and from a bank of statements (see screen shot above). There are various statement banks that can be used "out of the box". These can be completely customised with your own statements. When the report is complete it can be copied and pasted into a word processor for printing. It will be clear when you give the program a go! You can create as many statement files as necessary. See the testimonials opposite to see the kind of feedback that has been provided by the users of Report Maker. Works on any web enabled device, including PCs, Macs, iPads, mobiles. Large pool of statement files are freely available to use.